Download Visual Studio 2017 and ensure you choose the Universal Windows Platform development Workload in the Visual Studio installer. Open an existing project, or create a new project using the Blank App template under Visual C# -> Windows -> Universal. Important: Build 16299 or higher is supported by current version of the Toolkit. 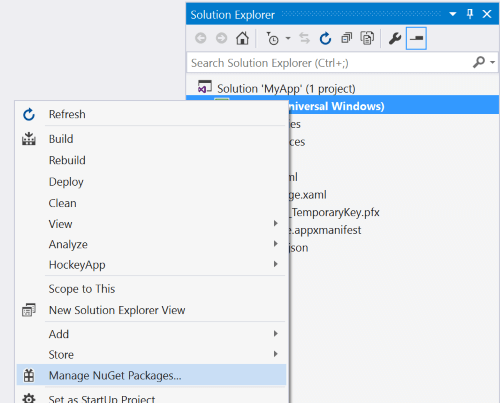 In Solution Explorer panel, right click on your project name and select Manage NuGet Packages. Search for Microsoft.Toolkit.UWP, and choose your desired NuGet Packages from the list. You can copy and paste code snippets for each feature from the Windows Community Toolkit Sample App. Download the Windows Community Toolkit Sample App from the Windows store to see the controls in an actual app. We recommend developers who are new to UWP to visit the Getting Started with UWP Development pages on the Developer portal. Visit the Windows Community Toolkit Github Repository to see the current source code, what is coming next, and clone the repository. Community contributions are welcome!